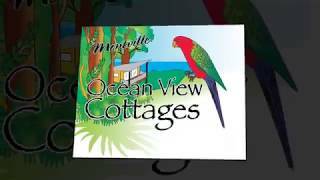 Montville Ocean View Cottages are set on 60 acres of pristine parkland, rainforest and gardens, overlooking the Pacific Ocean. Architect designed with modern contemporary wines, they are secluded and private. A 40 minute rain forest walk or a game of tennis, or maybe just relaxing to listen to the silence, these cottages are ideal for romantic getaways and honeymoons. Located just a short drive from Montville and Maleny and only a half an hour to the beaches of Noosa, Mooloolaba and Caloundra, it is a great central location to all the Sunshine Coast attractions. There are four one bedroom fully self-contained cottages of very high standard with a balcony overlooking the ocean.